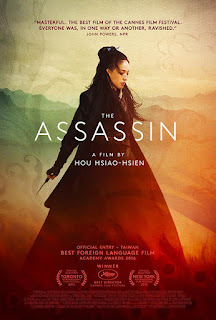 Based on what one can gather of the plot, THE ASSASSIN could very easily have been a straightforward wuxia, or Chinese swordplay film. Yinniang (Qi Shu) is a trained female killer whose compassion often makes her reluctant to do her job. That proves especially true when Yinniang is ordered by her master (Fang-Yi Sheu) to kill her cousin Tian Ji'an(Chang Chen), governor of the Weibo district. As Yinniang cases her intended victim, she learns of various intrigues taking place within Tian Ji’an’s government and family, and begins to have second thoughts about her mission. Occasionally the plot gets to a point where some sort of action scene is necessary, but these are dispensed with as quickly and blandly as possible. When it comes to art films, there’s a fine line between “painterly” and “watching paint dry”. With THE ASSASSIN, director Hou Hsiao-Hsien finds himself on the wrong side of that divide. This is a film composed mainly of long, lingering, medium. Performances are muted and subdued, and for long stretches neither the camera nor the cast move much at all. All this is intentional, part of director Hou Hsiao-Hsien‘s aesthetic. Action scenes seem to hold little interest for him. He’s more concerned with setting a tone and conveying feelings through lighting and composition. Lighting is dim and warm, and we often find our view of things obscured by sheer curtains. Many of the shots are quite lovely to look at, but as a whole the film is painfully dull. The audience and judges at Cannes and most critics are raving about this snoozefest, but I say the Emperor wears no clothes. 2 out of 4 stars. Why, because I don't happen to agree with your opinion of the film? It's not my job to validate your experience of a given film, only to report my own experience honestly and accurately. That's what I have done. And I'm quite happy here in Cleveland, Ohio, thank you very much.